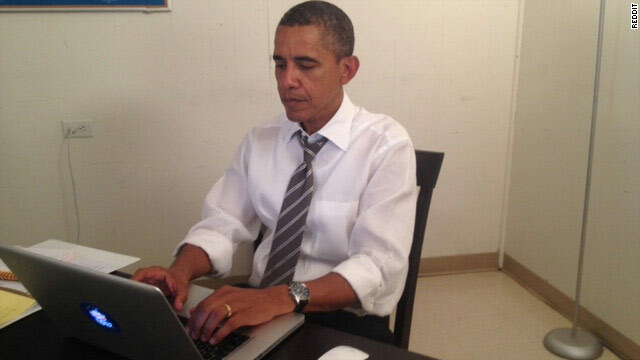 President Barack Obama posted this photo of himself answering questions on social-sharing site Reddit on Monday afternoon. (CNN) - This week, Republicans made a free and open Internet part of their party's 2012 platform. On Wednesday, during a visit with some of the most ardent open-Web supporters, President Barack Obama said Democrats will do the same. "Internet freedom is something I know you all care passionately about; I do too," Obama wrote during an AMA ("ask me anything") on social-news site Reddit. "We will fight hard to make sure that the Internet remains the open forum for everybody - from those who are expressing an idea to those to want to start a business." Obama became the most high-profile person to host one of the site's live chats, during which well-known figures take questions live. The site's two most popular AMA's before Wednesday were astrophysicist Neil deGrasse Tyson and "Jeopardy" champ Ken Jennings. There is NO freedom from Democrats, whatsoever. they want to tell you how to breathe, how to eat, and they want to put every last one of you on welfare, so you are reliant on government, and will vote Democrat to get a check! What is wrong with you? Stop writing bullcrap that isn't true, you bible thumping Republican. Riiiight. That's why there have been bipartisan efforts to force through legislation, having it knocked down just to re-emerge again. SOPA, CISPA, etc. Both parties can squawk about internet freedom all they want, but it seems more like their idea of internet freedom is the government's freedom to spy on everything the citizens do online. The picture is of Obama on Monster dot com. He is trying to find a job as a 'community organizer. ' However all the listing require that the applicant actually have job experience. well, he has 3 years as a State representative, 4 years as a senator and anouther 4 years as the ultimate Job on the planet, the President of the United States... you , my friend, on the other hand, are at a keyboard in your underpants pretending you're something important ... what a true LOSER you are.. and probably a hate-filled christian... like SO many of Todays make believe phony christians .. He has no skills in business, economics, or running a state...he may have advisers but it is his final decision that rules...and look what that has gotten us. He has made some very unpopular executive decisions in which the American people now see...He works more for himself and his re-election than he does this country!! Time to give him his walking papers !! DIFFERENCES,BUT WE NEED NOT HAVE HATE FOR ANYONE. I remember when Mike Huckabee said that he didn't think MITT had a soul. And, the supposed to be RELIGIOUS GUY MIKE gets up IN FRONT OF GOD and everybody else in the country, and spews the lie that Obama said the Gov't builds everything and screw everybody else. This was ONE SPEAKER AFTER ANOTHER lying, lying, lying about that one thing. If you really believe in God, don't you think God might call you up on your lying, lying, lying?? Mikey doesn't seem to think so, it's obivous SO THAT makes him a phoney. But, this convention proved that some people don't care about facts-–and, that says YOU ARE A PARTY HACK. Where in our Constitution does it say you are a Republican/ Democrat/ Libertarian first before you are an American citizen? ........It doesn't. If you can't win without LYING on subjects easily found out about, and you can't win without Citizens United who might be funded by people who aren't even citizens, and YOU can't win without suppressing part of the population's vote and depend on the Supreme Court to rule in your favor THEN you can spout off all the lies you want BUT you can't say you are doing it in the Spirit of the Founding Father's INTENT that this nation be free of tyranny. PERIOD!! WAS ROMNEY DOING THAT AT BAIN OR WAS THE CONFISCATED CO. A NEW BAIN? AMERICA IS SICK OF THE OBAMA LIES ... AND, THE SINKING ECONOMY. OBAMA, I AM NOT CONVINCED. THIS IS SOMETHING PEOPLE CAN EASILY CALL BS ON IF THEY KNOW ABOUT THE INTERNET WHATSOEVER. TOO MUCH POWER IS SHIFTING TO THOSE WHO WANT TO CONTROL AND RESTRICT THE INTERNET AND IT IS HAPPENING UNDER HIS WATCH. SOPA ALMOST BECAME LAW AND ITS ITERATIONS HAS NOT STOPPED THREATENING THE INTERNET. OBAMA, DO BETTER OR AT THE VERY LEAST STOP LYING ABOUT IT. SHAME ON YOU. Don't write things you do not know is true and you came up with in your little brain. Are you sure Pres.Obama actually wrote something on AMA site or was it his speechwriter. Obama was given a book contrdurian 1990 by Simon and Schuster. Nothing resembling a manuscript was produced and they pulled the contract after three years. We already know Obama is lying again. Obama has already been caught in so many lies ... and, lots of video tape proves it ... do the people of America really want to trust obama with control of the internet. The internet is one of the only free vehicles for free speech. The last thing we need is a power hungry politician, who is always trying to control and tax everything, with a history of going back on his word, to 'fundamentally transform' the internet. HE MAY HAVE LIED BUT IF YOU ARE ASKING IF ANYBODY SHOULD BE TRUSTED TO HAVE CONTROL OVER THE INTERNET THEN YOU MISSED THE POINT. BADLY. TRY NOT TO MAKE THIS AN AGENDA FOR YOUR IDEOLOGY BECAUSE THERE ARE PEOPLE FROM YOUR SIDE WHO STARTED THESE LUNATIC LEGISLATION, FROM BOTH SIDES REALLY AND I AM SEVERELY DISAPPOINTED THAT OBAMA WAS WILLING TO GO ALONG WITH IT. HE SHOULD BE BETTER THAN THE LIARS LIKE MITT ROMNEY AND PAUL RYAN BUT I GUESS IT IS A DISEASE ALL POLITICIANS HAVE. Democrats need to do what is best for the country, vote for Gov. Romney. Meanwhile.., out here in Reality,. The four-week moving average for initial jobless claims rose by 1,500 to 370,250. 370,250 X 4 = 1.481,000 jobs lost in August. 4 yrs after Obama took office..
Heres some free web Olameo u said "I wont run if i dont cut the deficet in half, transparent=fast & furious just honor your word for once, just once honor your word and GET OUT U TRIED U=FAILED, GET OUT LOSER. do we really need to keep going ???? Judy ... It's time to take down the faded posters of obama, from the walls of your childhood bedroom, in your mommy and daddy's house, and get a job !!! Maybe then, the rest of us hard working Americans will take seriouly your demands for more taxes going to free loaders who don't pay any taxes, or don't work at all. Maybe then, you too will resent obama for squandering half of your paycheck on payola to crooked companies, like Solyndra. I'm sorry, but just because she has an opinion that differs from your views (and that of the rest of the posters on here), she must be living at her childhood room at her mommy and daddy's house and must not be a working American? Are you so deluded that you think the Republican party are the only ones that have working people? I watched as SOPA was nearly passed, until it was denounced by the masses in the country and Obama himself. I have also watched friends and family of mine not be able to go to the doctor because treatments were too expensive and they made too much to qualify for low-income healthcare and had pre-existing conditions so they didn't qualify for insurance companies. Screw your right-wing propaganda. I was raised with it, I voted for it once before, and I will never do it again. SO ORIGINAL of you to PARROT RYAN's SPEECH. Did you get a Ryan Mask to wear?? You'll like this story Howie, it's about Chris Christie talking to the delegates today about their enthusiastic cheering problem. Like, you guys are 'DUDS'. He was begging them to empty their tanks for Mitt tonight. I'M MAKIN' A BET -–CLINT EASTWOOD will be having the ladies throwing their UNDIES on stage. THEN, Mitt will come out, talk about being a MORMAN and make them all FEEL DIRTY about how Clint was standing in a sea of lace and loveliness and EVERYTHING CHRISTIE SAID about getting excited for Mitt will be just like a BAD DREAM of your parents sending you away to a Home-for-Unwed Mothers. Hahahahaha! An excellent writer? We were told his books are true and then we are told the are not. So are YOU referring to him being an excellent FICTION writer? Judy, I would not pay much (or any at all) attention to Howard. He continually copies and pastes the things he hears and reads with no effort in fact-checking it. Even his most recent copy and paste post has a quote from Paul Ryan about "fading Obama posters." I think "bot" would be the appropriate internet term for Howard. My dog will be voting in Texas this year, along with all the other illegals since the fed judge struck down the voter I.D. law. Rufus has been practicing with his paw print. Barack, The YokeMaster doesn`t understand the word "freedom". He thinks it means "property" / his property. Talk about a YOLKMASTER - Calista Gingrich shows up with the NEWTSTER on stage tonight. You mean his WIFE was on stage with him. The shame! Sounds like the romney zombies are out in full force .. you can tell a zombie, because when you ask them why he doesn't show more tax returns.. THEY ACTUALLY DEFEND his Postion of HIDING HIS TAXES.. then WHY OH WHY would he have Given TWENTY FOUR YEARS WORTH to the Limp armed Cancer Face, John McCAin.. all for a VP Position ... just what the Hell is this man hiding that the GOP KOOL ADE DRINKERS don't even want to know His Truth ..
ONLY if you lick the boots of the federal government !!! To the good life on the government plantation !!! then, their speeches would have been only around three sentences long. It would've been a mighty short Convention!